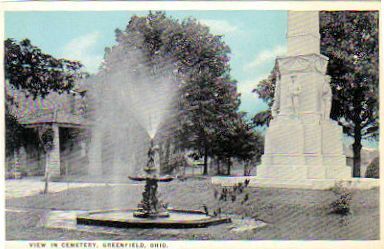 Comments and/or suggested corrections received from viewers of this site are posted below with the date we received the information for possible help with your genealogy research and the Greenfield Historical Society makes no endorsement of the information as being accurate. All but one is in Section 2 Lot 77. T E Powell is Thomas Elwood Powell, a Civil War Veteran. Ella Boggess is Ella (Powell) Boggess, another daughter of Thomas and Uria. Her date of birth is 11/20/1856. I have a paper handwritten written by Arwilda sometime between March 1 1895 and December 12, 1899, on which she listed the complete names and dates of birth for her parents and all of their children. I believe it was written between those dates because she included her father's date of death but not her mother's. In addition, I have my mother's Stevenson Birthday Book, wherein her grandparents, Ella and David Boggess, each signed on the page corresponding to their birthday, and each added their year of birth; Thomas' complete Civil War Pension record and that of Uria for her pension after his death, both from the National Archives; and a picture of Alvaritta where she wrote her name and address on the back. She is located in 3a 25 with her sister Alice Florence Porter. There are 2 Carrie's listed, but should be combined into one. They are the same person. Name correction: Catherine, wife of G. D. Ritchie (not Ritchis); William G. Ritchie (not Ritchis) is Catherine's son. Walter Oscar Beatty is incorrectly listed as 1st name Walter last name Oscar. He should be listed as Last Name Beatty, not Oscar. His tombstone is not clear. He is buried in Jeremiah Kerr's plot (182 3B) because he is his son-in-law and was married to his daughter Mary Cunningham Kerr Beatty. Leslie Edward Phillips should be listed as Leslie Edward Patton. He is the son of Willard and Mary who are listed under the correct surname.